Ludington residents know who to call for their tree service. Totally Trees has been serving the Ludington area for over the past decade. Why Choose Totally Trees For Your Tree Service? We also enjoy a challenge. Where other tree removal companies fail, we prevail. We have removed a number of trees of off houses. Most of those were failed tree removal attempts. 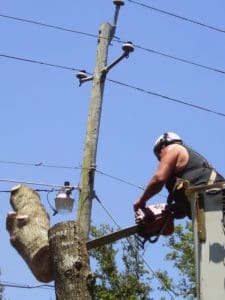 We have also been contracted by numerous other companies to help them with dangerous or rotten tree removal. Our ability as a tree removal company, is unmatched. With proper equipment, professional field crews, and safe planning, any tree can be removed safely and clean. Give us a call today if you are interested in getting your free quote. You can also use the form below to request your free quote.